Afterwards create a pixel file, either in TIFF or PSD format or a PDF, from the reference file by using the Export Chart tool to be printed on your device and Measure the test chart with a spectrophotometer. Redundant patches for paper white and primaries are automatically added to newly generated profiling test charts (affects medium and large charts containing 2 or more channels). This allows better verification of printer stability and results in better averaging and redundancy correction of profiling test charts. Profiling: Use this mode to create typical test charts for profiling printers. 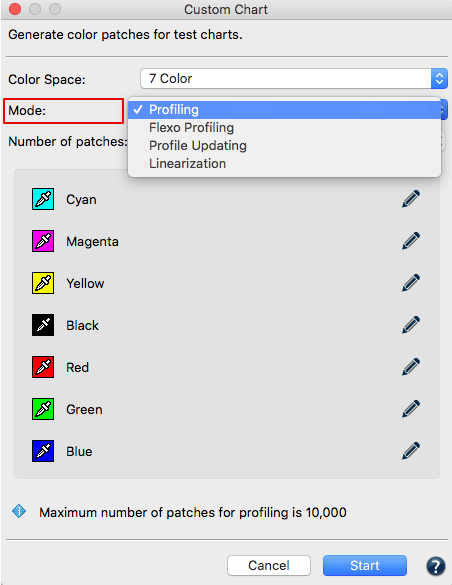 Flexo Profiling: This is similar to the profiling mode however more patches in the highlights are generated to better capture the behavior of Flexographic presses. Profile Updating: Use this mode to generate test charts with a minimum amount of patches to be used in conjunction with the Update Profile module in CoPrA. Linearization: Linearization charts only contain patches of the primaries. The following description will show you how to generate a reference file for profiling by using the Custom Chart tool. Depending on the color space different options are available. To generate Multicolor reference files an additional Multicolor license is required. Choose between generation of reference file with or without linearizing the primaries. Note: A linearization is always helpful if the printing system tends to print unexpected, e.g. colors are far too dark due to strong tone value increase. 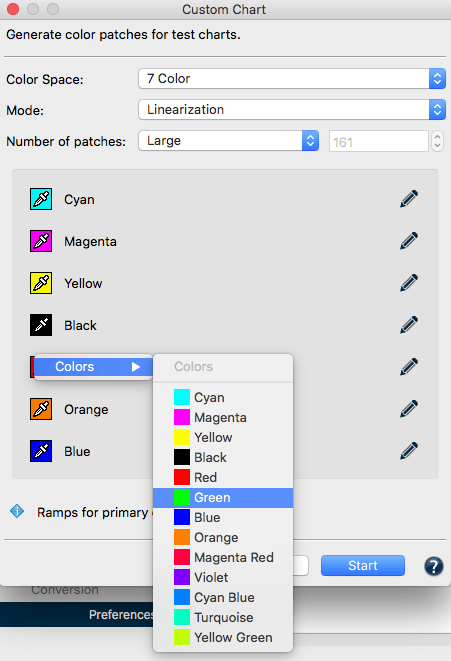 A linearization helps to distribute color patches in the best possible way for that printing system. In addition, ColorAnt generates a very smooth and homogenous linearization, to avoid bumps in the distribution color patches in a test chart. To work without linearization, simply open Custom Chart and select the Color Space in the drop-down menu. 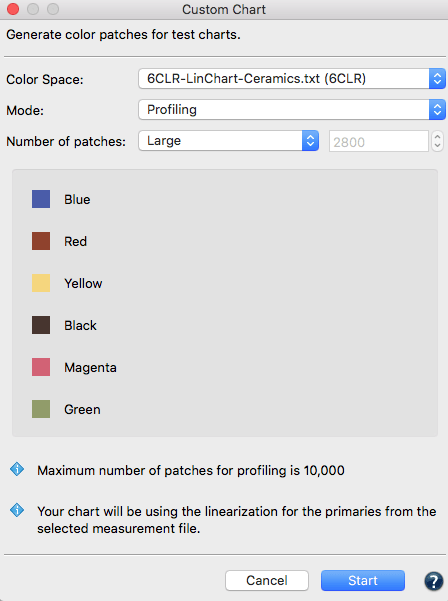 Note: You do not need a separate linearization step in ColorAnt if the RIP calibrated your printing system or if a dedicated CtP curve is used or if the printing system doesn’t show any irregularities in the output. To work with additional linearization measurement data from a linearization test chart is required that was output on your printing system and measured with a spectrophotometer. 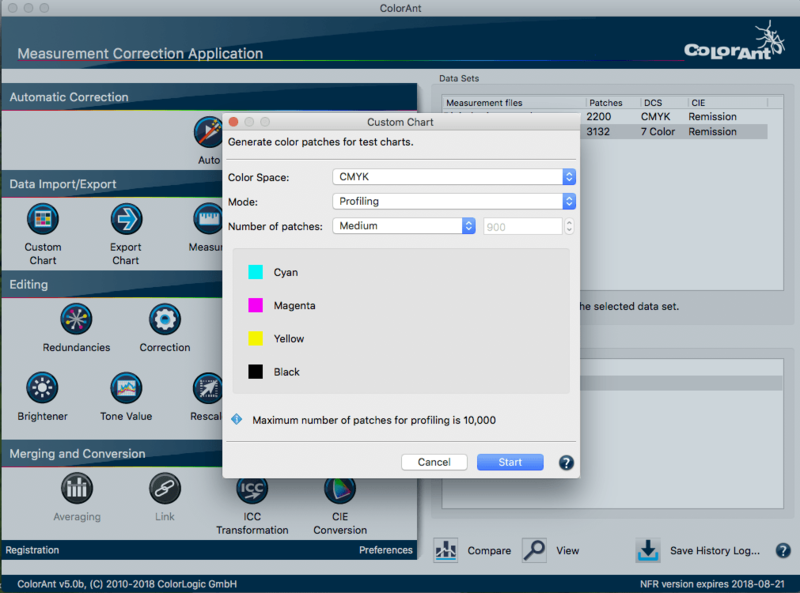 Load the measurement data in ColorAnt before opening the Custom Chart tool. Note: You may create a linearization chart yourself using the Mode option Linearization or you may use for a CMYK system for example the file Linearization-CMYK-v1.txt (also check screenshot), provided from ColorAnt under File/Open Predefined or for a 5 color CMYK+X printing system the file Linearization-5CLR-v1.txt. Select the previous loaded measurement file in the drop-down menu Color Space. ColorAnt automatically recognizes the color space and visualizes the channel names. In addition an information message regarding linearization will be shown. Select the type of test chart you need from the drop-down menu under Mode. Define the Number of patches. This will effect how precisely the device color space will be filled with color patches. Please take into consideration, the available space on your output, required accuracy of the characterization data or characteristic of your printer. You will find three predefined amount of patches presets for large, medium and small test charts and a custom option allowing you to enter your own number of patches. Note: Our tool is programmed in a way that even with only a few patches, the color space is covered in the best possible way to allow proper profile creation. As soon as you click the Start button, the reference file will be calculated and shown under Data Sets. Device color space and number of patches are included into the file name. Save the reference data under File/Save as if you may reuse it in other programs for test chart generation. Use Export Chart in ColorAnt to create the test chart image. Note: Read this article about using our reference data in other programs such as X-Rite i1Profiler to generate test charts for the X-Rite i1iO and iSis. Note: Requires a ColorAnt L license. Similar to the standard color spaces Gray, RGB or CMYK you may choose also in the case of Multicolor between generation of reference file with or without linearizing the primaries. The required steps are the same – see the description above. If you like to work without linearization, simply open Custom Chart and select the Color Space in the drop-down menu, e.g. 7 Color and the Mode. ColorAnt uses pre-defined colors for the channels, which you may modify as you like. By using the eyedropper tool you can change colors and order of colors. For example, if you like to switch the color Red with Green (see screenshot), click on the red pipette and chose in the context menu under Colors the color you like, in this case Green. Note: If you previously opened other measurement data in ColorAnt you will also see in the context menu under Color the channel names of those measurement files. Simply choose the required color here. 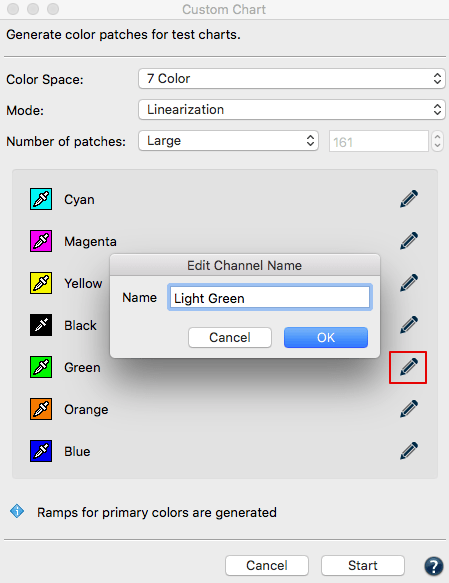 To adjust the channel name of a color use the pencil tool on the right side of the dialog box and change the channel name as you like. To generate a generic Multicolor test chart decide on the number of channels and their names (with or without CMYK), so that it is as close as possible to the used colors on your printing machine. It is not necessary to define the channel colors in the reference data exactly. Just make sure that you are close to the kind of color so that the correct color combinations will be generated. For example, if you want to print a violet, you may chose blue as the channel color, but not green or red or cyan. 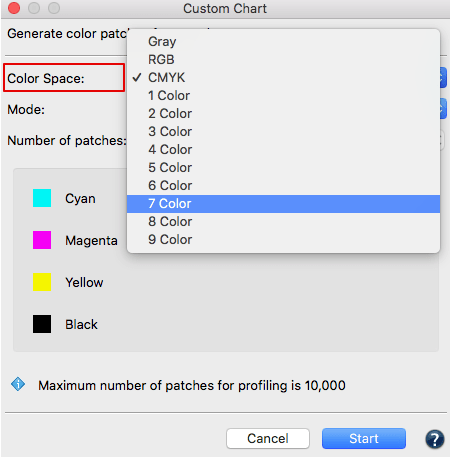 Note: In ColorLogic CoPrA multicolor profile creation three chromatic colors + optional black + a maximum of three gamut expanding colors are supported. Some examples for possible combinations are: CMYK+Orange, CMY+Green+Blue, CM+Orange+K, CMYK+Red+Green+Violet etc. Other non gamut extending colors positioned within the CMYK color gamut may lead to problems in profile creation. Use the Spider Web in the View dialog to check for problematical color combinations in your measurement data. CoPrA supports three main chromatic primary colors which should span a suitably large gamut encompassing the gray balance. Typically this is CMY but it can be any other appropriate chromatic color combination. Note: Following this approach, printer profiles of up to 10 channels can theoretically be created by CoPrA 5 and higher. However, it is not recommendable to use printer profiles with more than 8 channels in production as every additional channel increases the profile size exponentially so that either a very low grid size or an exorbitantly large profile had to be used. When using a typical Multicolor color space with CMYK parts, the additional inks Green, Orange and Violet extend the gamut in each section of the three primary colors. In between each section, a single gamut extending color is used creating a color space with 7 colors. Some inkjet printers use Red and Orange in addition to the standard CMYK inks. CoPrA is able to profile such a 6 color printer since Orange and Red are two gamut extending colors of the main primary color sections Yellow and Magenta. Note: When working with two gamut extending colors, special test charts must be used. CoPrA provides appropriate Multicolor test charts which are available via Tools > Open Testcharts folder > Multicolor. To create Multicolor profiles various test charts (multichannel Photoshop PSD files) with associated reference files are available for measuring with ColorAnt (or any suitable measuring software). These Multicolor test charts can be found in the folder Testcharts (in CoPrA's installation folder). The folder can be opened directly in CoPrA (menu Tools > Open test chart folder). The contained Multicolor test charts are specifically optimized for the algorithms used by CoPrA. Alternatively, you can create your own test charts for your multicolor process using ColorAnt/Custom Chart. The name of the test chart contains the number of channels, the color combination and the number of color patches. From the name of the test chart CL-CMYKB-2140 reflects that it is a 5-channel test chart with the color combination CMYK+Blue and 2140 color patches. However, by 'Blue' we mean a fairly broad color range of reddish to greenish blue. For example, it contains violet as well. The following color abbreviations are used in folder and file names: R = Red, G = Green, B= Blue, V= Violet, O = Orange, Yg= Yellow-Green. For a Hexachrome printing process with CMYK+Orange+Green, use the corresponding test chart, CL-CMYKRG. Here, CMYKRG stands for CMYK+Red+Green, whereby red includes orange. For 7-color printing use the test chart CL-CMYKRGB. In addition to the colors CMYK it also contains the additional colors Red+Green+Blue. Nine special test charts for 6C and 7C color combinations have been available for two Gamut-extending colors (e.g. CMYK+Red+Orange). They can be found in the folder Special. The layout of the supplied test charts is designed to fit on A4 or US letter size and is optimized for the hand-held measuring devices supported by the Measure Tool. As all patches cannot go on one page the Multicolor charts are split in multiple pages which need to be measured in corresponding sequence (1_6 means it is the first of six pages). The total area coverage (TAC) of 400% is not exceeded in any of the test charts, not even in Multicolor test charts. Please make sure that the RIP or the output system of the printer supports Photoshop multichannel PSD files. If this is not the case please open the test charts in Photoshop (or another suitable image editing program) and save them as DCS2 files. The test charts are optimized for the X-Rite i1Pro measuring device, but can also be measured with other any single color measuring devices. For measurements with the X-Rite i1iO, Barbieri Spectro LFP and Konica-Minolta FD-9, we recommend creating a customized test chart file based on the corresponding reference file using ColorAnt’s Export Chart tool. To use a measuring device that is not supported by ColorAnt MeasureTool, it is necessary to create a test chart which is suitable for that measuring device and the intended printing process. Make sure to select the reference file matching the color system. The reference file is provided by CoPrA and located in the same folder as the test chart files. It can be recognized by the TXT extension and contains all required color patches. Please note that our reference files use a maximum total area coverage of up to 400%, even for 7 channel color systems. 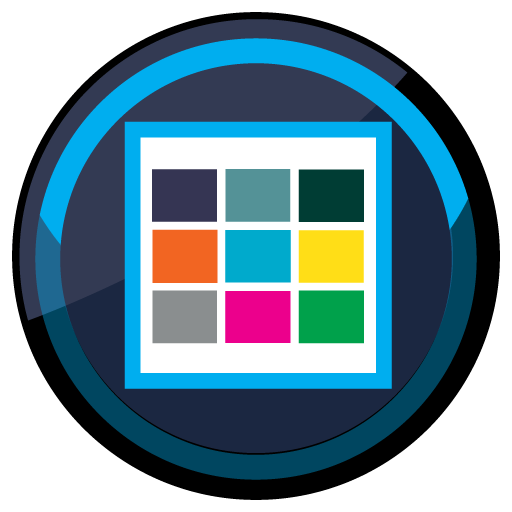 For Multicolor profiling - in contrast to CMYK Profiling - the test charts has to be adapted to the calculation algorithms in order to minimize color patches, otherwise, test charts would be exceptionally large. Note: Multicolor profiling differs from manufacturer to manufacturer. If you would like to use measured Multicolor test charts from other manufacturers in CoPrA, please note that these test charts may not achieve optimal results in CoPrA. If it is not possible to reprint CoPrA's test charts and use existing measurement data from Multicolor test charts of other manufacturers, it is recommended to optimize these measurement data using ColorAnt before creating profiles in CoPrA. The Rescale tool allows adaption the measurement and reference values in ColorAnt according to suitable CoPrA test charts. Any missing measurement values will be interpolated which may result in inaccuracies if alternative test charts of other manufacturers reveal many gaps. CMY test charts are available for printing systems that do not use black. Please send an inquiry to supportdesk@colorlogic.de. For example, when working with CMY+Blue, use the appropriate test chart from the folder CMY+B. Note: Previously, many users worked with standard CMYK test charts, such as ECI2002 or IT8/7-4, for color combinations without black, replacing the K channel with blue, e.g. CMY+Blue. Although this approach seems practicable at first glance, it is not recommended, because the process color black plays an entirely different role to a gamut extending color blue in CMYK test charts. Accordingly, many color combinations in the CMYK test charts are unnecessary, or even missing for a blue process color. It is preferable to use CoPrA in combination with CMY+X test charts in order to obtain the best possible profile quality.